Like any major city, it can be confusing to visit for only a short time. There’s simply so much to do and it’s difficult to prioritise what to see and what to miss out on. 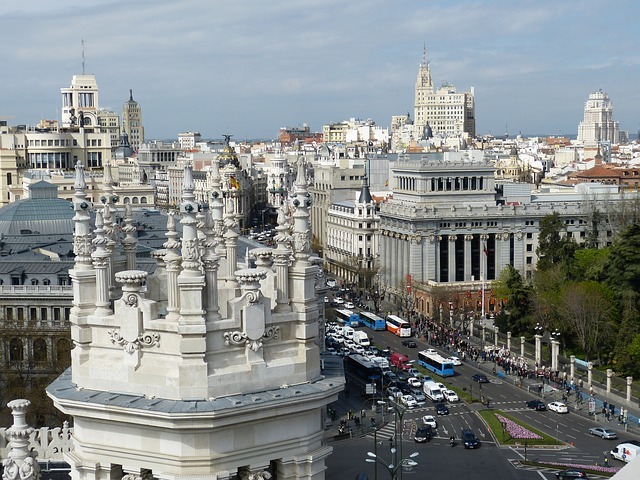 Madrid is no exception and although not known primarily as a tourist resort there’s a huge amount to do for any visitor. Pieta being restored, Prado Museum, Madrid The Prado Museum is regarded as one of the world’s great museums. The multinational exhibits include works by Spanish artists such as El Greco and Velázquez, Italian painters such as Fra Angelico and Raphael and Flemish artists as Bosch, Rubens and Van Dyck. The best known works include Velázquez’s Las Meninas (The Maids of Honor), Goya’s Naked Maja and Clothed Maja, and Bosch’s The Garden of Delights. Plaza Mayor, Madrid The Plaza Mayor is an impressive 17th century arcaded square in the heart of Madrid. It has played a vital role in the history of Spain for over 400 years and has seen bullfights, festivals, plays, public burnings of heretics, and the crowning of kings. It is adorned with eye-catching multicolored murals and is surrounded by baroque architecture. In the 1970s, vehicles were prohibited from the plaza and as a result, it is a lively place in summer filled with crowds attending concerts and festivals or simply milling about. The square plays host to a range of shops and cafés and to some of the most spirited tapas bars in town! Puerto del Sol, Madrid The Puerta del Sol is regarded as the true geographical heart of Spain – lying right in the middle of Madrid. All distance markers along the roads on the national Spanish highway system use Puerta del Sol as their reference point and on New Year’s Eve each year Puerta del Sol becomes Spain’s “Times Square” with thousands of revelers packing the square swallowing grapes at each of the twelve strokes of midnight. The Puerta del Sol is the most popular meeting place in Madrid. Bull fighting, Madrid While bullfighting is certainly not to everyone’s taste, it is a tradition the Spanish have held onto proudly over the centuries. Not for the faint-hearted, the fervor, bravery and skill of the matadors captivate the crowd as the battle between man and bull takes place. The Las Ventas bullring is often referred to as the mecca of bullfighting. The best time to visit is from March to October when there are bullfights at Las Ventas each Sunday from 7:00 pm. Beware these are of course not too everyone’s taste and if you’re unsure this is probably an event to skip. It’s difficult to describe and nothing like watching on TV, incidentally while in Spain you can access your home TV stations by using a system in this article – Can I Get BBC iPlayer in Spain.